Today seems an important day to resurface – a day of reflection, gratitude, and hope. I watched one tribute video on YouTube with various slides and video from this fateful day 10 years ago in order to reflect and recall with purposeful intention. And now I have an obligation to continue moving forward and live my life to the fullest, for those I have lost, and for those who are right here by my side. Due to personal circumstances, Project Scarf has been quiet for a while, but rest assured we are percolating along, even if I am not blogging. So, here I am, and I have LOTS of thank you’s and contributions to share. 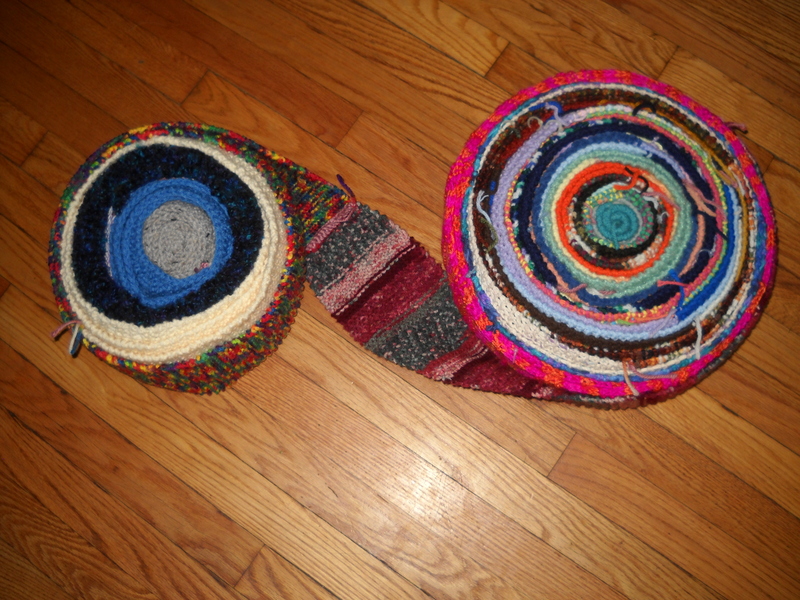 Next, received on August 31, 2011, from Natalie E. (also from South Plainfield, NJ) 5 beautiful sections totalling 144 inches – that’s 12 feet exactly, also know as 4 yards…Thank you Natalie! And in case you’re wondering about the South Plainfield theme, this is the hometown of my dear hubby. I have his awesome mom Barbara Dalto (otherwise known as “Nonna”) for getting her church ladies knitting for Project Scarf. Thanks Nonna, for your never ending support, patience, and tolerance for every scheme I come out with, regardless of how crazy it is. Next, we have two internet followers whose submissions both arrived at my door on September 2, 2011. Kathleen Bode's Dr. Who "mini"! Thank you Kathleen, not only for your contribution, but for all of your support and posts on Facebook. And last but not least, Joanne V. from Schenectady, who read about us at timesunion.com, sent a gorgeous variegated green and white scarf totaling 51″ in length. Thank you Joanne, for submitting anyway. We have decided that the Guinness Book of Records requirements were too limiting, and we want EVERYONE to be able to participate. So, although we may not be “official”, we will still be having a great time, making something beautiful together, and warming up a lot of people in need when we’re done. 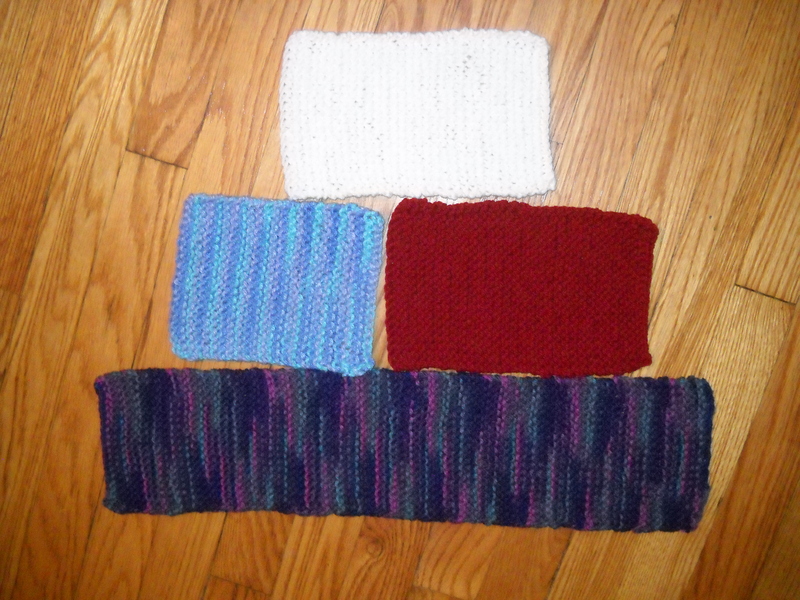 I am happy you are, too, Joanne – thank you from Project Scarf! 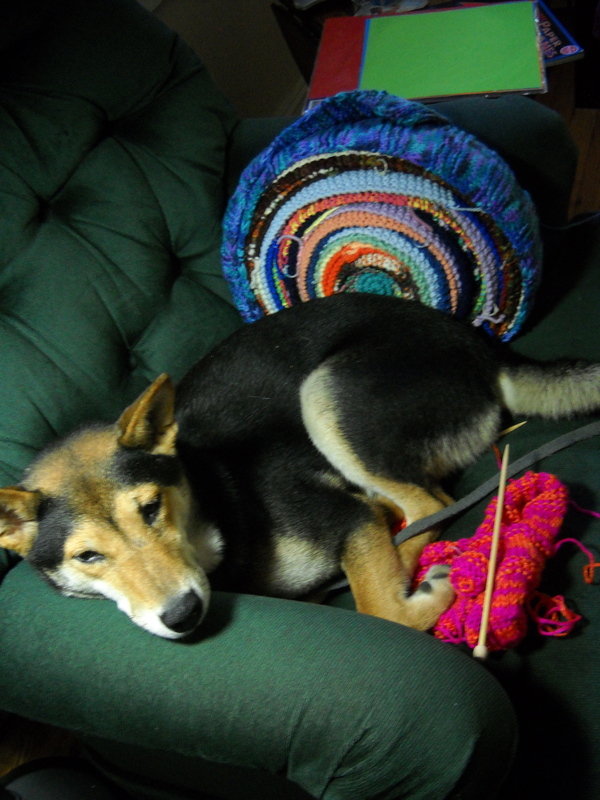 Well – that’s it for now…keep on knitting everyone, and go give someone you love an extra hug today. 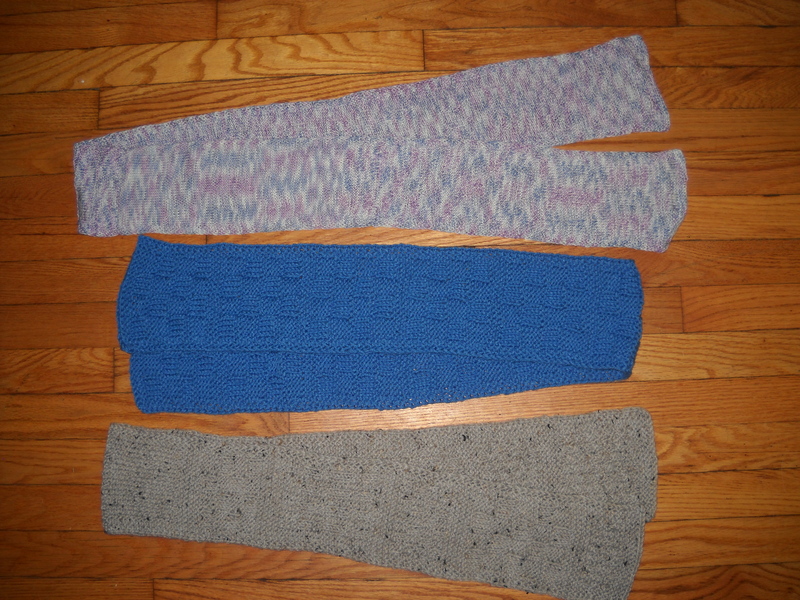 Thanks to Ann M., of Edison, NJ, for sending our first Project Scarf section of “fun fur”! I think I may just need to knit up some more to go with it! Ann will be added to our Project Scarf “Wall of Fame“, and will have the distinct honor of bringing Project Scarf over it’s 100 FOOT mark! (Once I attach it, my family is demanding a 100 foot party…I’m all for it. Sounds like a great reason for a party to me! 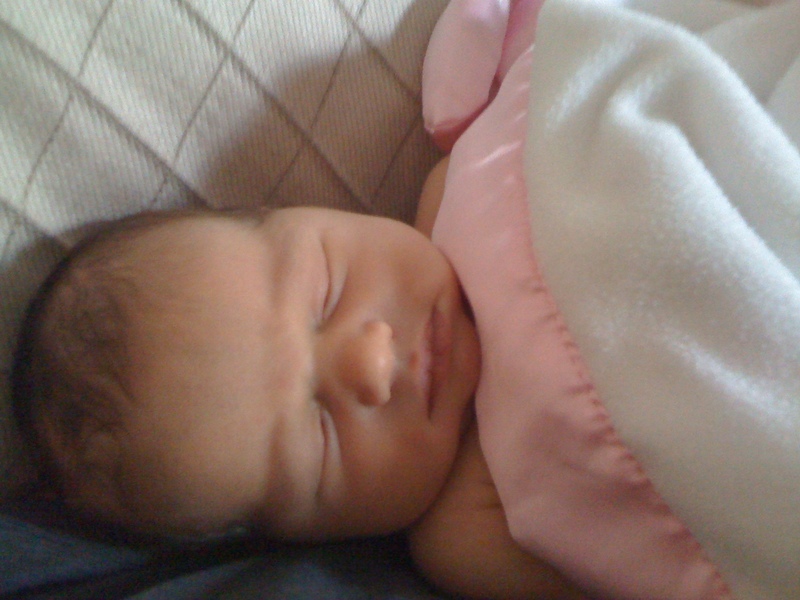 Sorry it has been a while folks…life has been, shall we say, for lack of a better word “busy”. 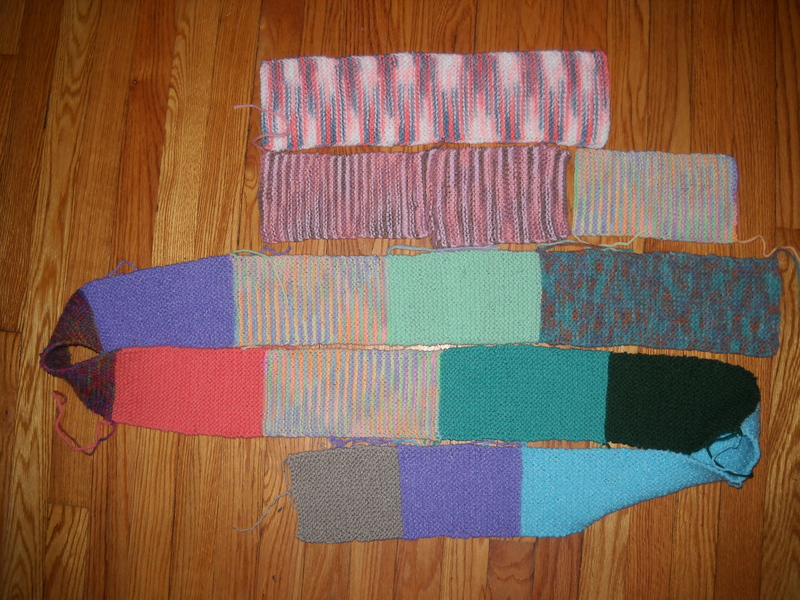 Meanwhile, Project Scarf continues to grow, both in length and fellowship. Gratitude is my word of the day, week, month, year, lifetime. Scarves keep coming in, kind words keep coming in, and stay tuned for another article! This one will be in OM Times, written by the fabulous and multi-talented Leila Cook. I’ll post the link as soon as it’s up. Next, I had to lay it out in sections, and actually used my husband’s work tape measure, rathy than my flimsy (TOO short!) knitting tape measure. 93 feet and 9 inches! At last measure (which is NOT the most current), P.S.was up to SEVENTY SEVEN FEET AND ONE INCH! That is the height of the Tsunami in Japan last March. OK – I finally got an official response from Guinness. 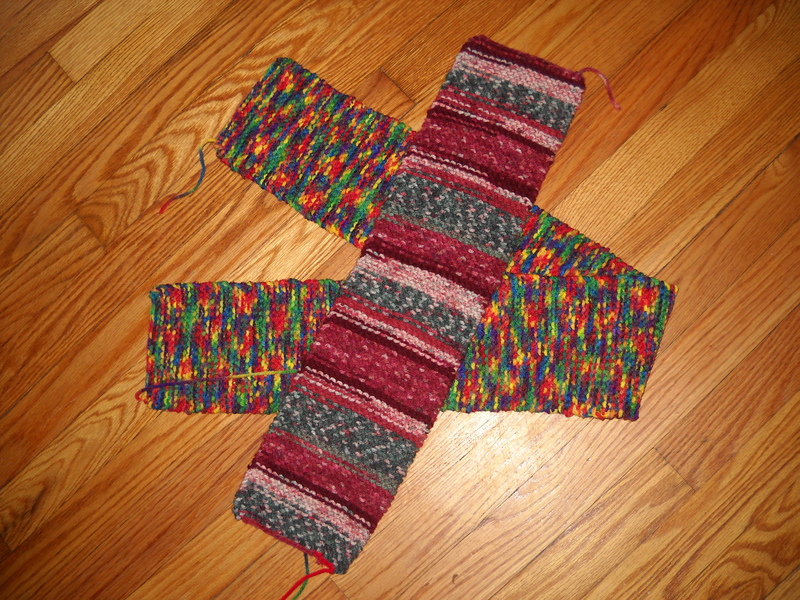 There IS a record for the world’s longest hand knit scarf. The longest scarf knitted by a team measures 54.29 km (33.74 miles). It was knitted by the volunteers, friends and supporters of Ty Hafan – The Children’s Hospice in Wales. Work started in May 2002 and the scarf was measured at the Millennium Stadium in Cardiff, Wales, UK on 23 June 2005. 1. Needles must be 4 mm (No. 8 UK). Casting must be done in the conventional way using two needles. 3. 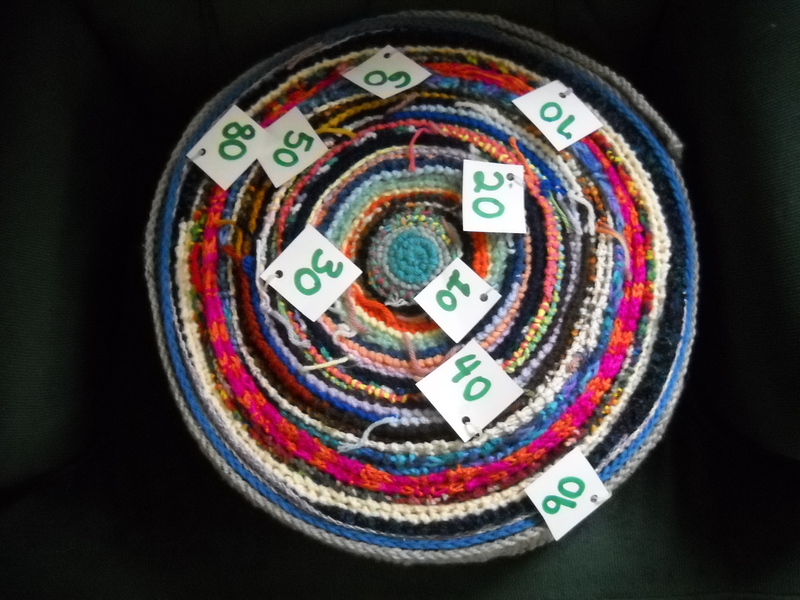 Number of stitches per row – 66 (in garter stitch). 4. Width – 30.5 cm 12 in. 5. 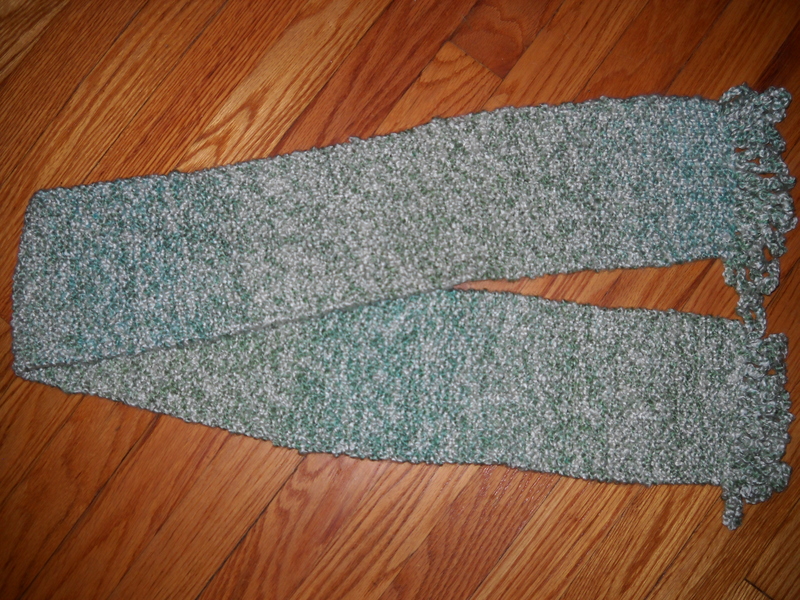 The knitted lengths must be firmly sewn together with wool using overstitching to complete the scarf. The scarf must not be stretched while measurements are being taken. 2) I hesitate to limit the requirements so much…personally I prefer the simple 5″ inch wide requirement – leaves the whole process much more inclusive and open to creativity. I hope this does not slow us down, but I am content to try to break the length record unofficially…purely for the process, for the building of community, for the promotion of the art of knitting, and for the glory of being able to say “we did it!”, and then to know that all of those lovely scarves will go to help people in need. 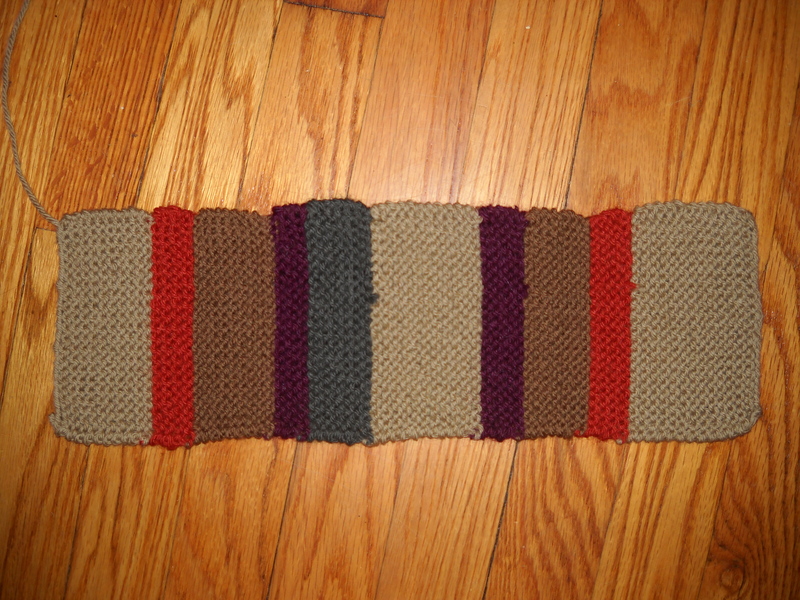 So now, anyway, I have an actual length to strive for: Project Scarf must grow to more than 33.74 miles! Holy cow, we’re going to need a huge team of people to lay it out and measure it when the time comes! If anyone can do it, it’s knitters. 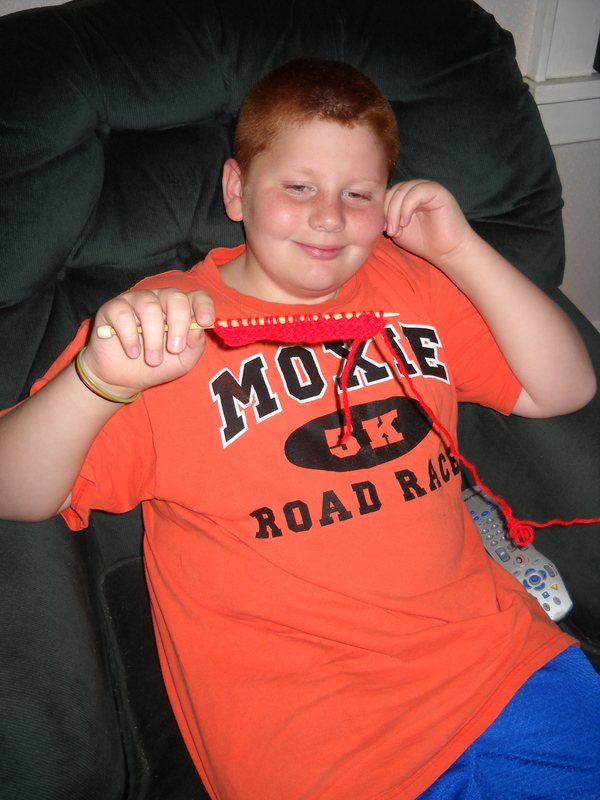 OK – so my awesome 10 year old son learned to knit yesterday while we were sitting at the pool and knit his first few rows for Project Scarf in a beautiful red. 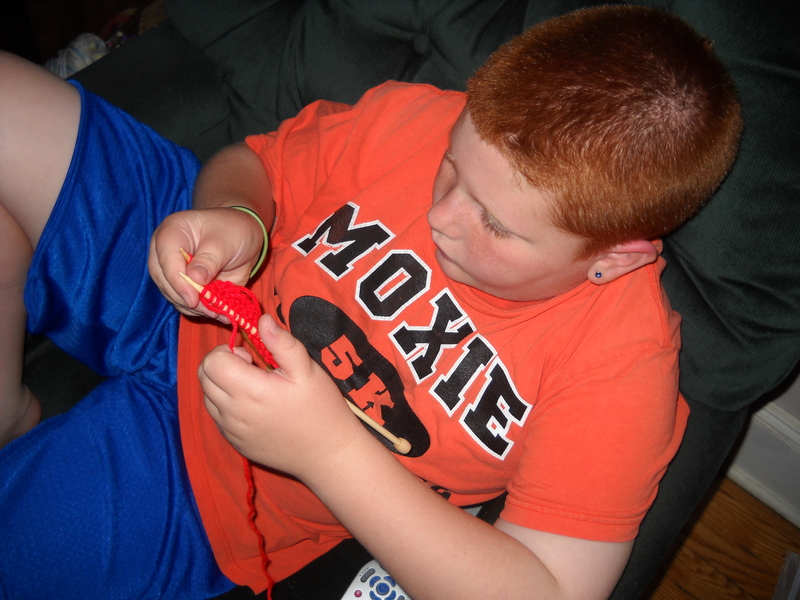 I know I’m his mom, BUT…he was honestly one of the quickest newbies I have ever taught – not only picked it up right away, but his stitches are perfectly beautiful and even…not a hole or dropped stitch in sight. He approached the task with great seriousness and concentration, and not an ounce of frustration. He’s already talking about knitting a cap. Oh well – he comes by it honestly! So I arrived home from the latest sojourn to be greeted by TWO more Project Scarf packages! 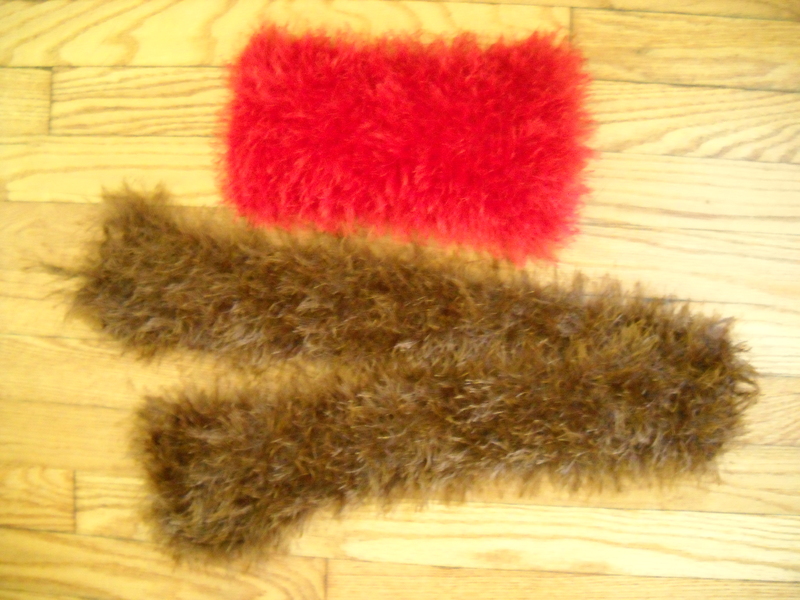 Special thanks to Pam J. from Oklahoma City, who sent 2 lovely scarf sections, totalling 64 inches in length. Thank YOU Pam, for joining Project Scarf! You are now an official member of our Project Scarf Wall of Fame :-). The second box was from Jennifer Marsh of Huntsville, Alabama, founder of the International Fiber Collaborative. Please check out her Dream Rocket Project – it is SO cool, and very similar in spirit to Project Scarf. I just wanted to let you know that on my way out of Columbus, OH yesterday, I dropped a box off at the post office for ‘Project Scarf’ which I am inspired by. It is not much, but I hope something in the box helps. 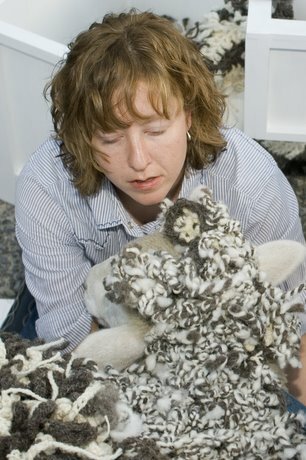 You will find some hand washed, carted, and spun wool in which I did during a sheep project of mine back in grad school. I have a whole bin of it that just sits unused, and thought some how it might come in handy. Jennifer sent a box filled with goodies from our wish list – it was like Christmas in July! Inside was her gorgeous wool, an assortment of notecards and envelopes, quart size ziplocs, and some brand new crochet hooks (which I DO use for joining scarf sections). Also, she enclosed brochures about her Dream Rocket Project, which I look forward to passing along. Jennifer has now officially become a Project Scarf Angel. Thank you Jennifer, and I look forward to a continued relationship! 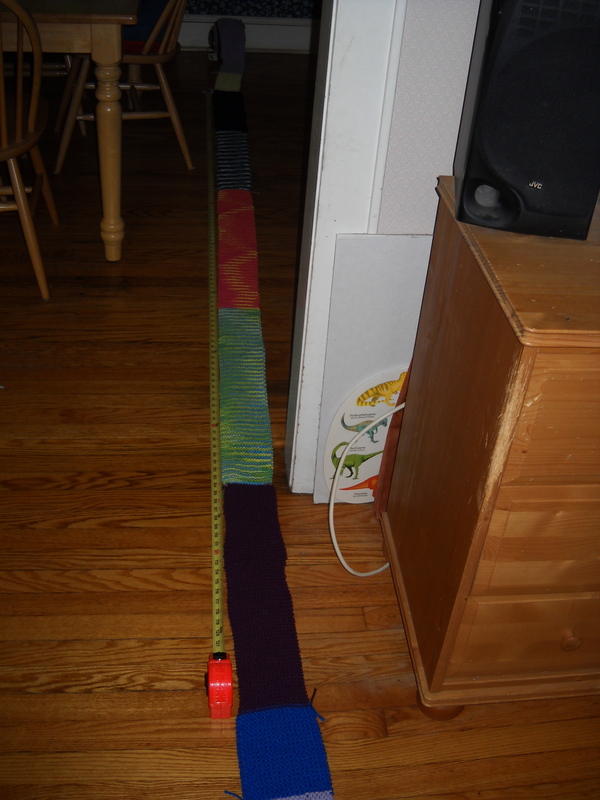 Total Scarf Length: 56 feet and four inches! 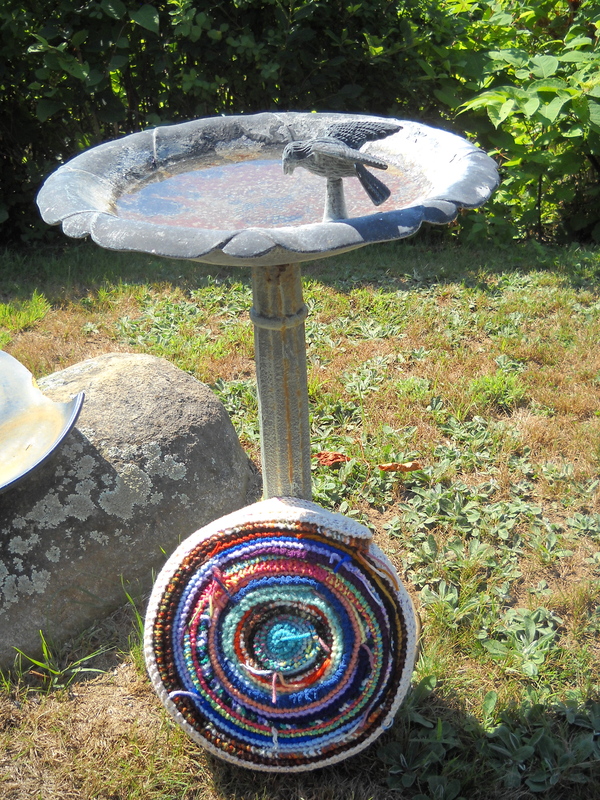 Click here to see an updated list of the places Project Scarf has been recently!